Vinson ED Mil Med. 2004 May;169(5):403-5. Décomprimer un thorax est indispensable en cas de pneumothorax suffocant. Si la décompression à l'aiguille est souvent présentée comme la technique de référence, encore faut il que sa réalisation soit faite par voie latérale avec un cathéter de calibre et longueur suffisant. Néanmoins cette technique est sujette à échec. La thoracostomie au doigt est la méthode la plus efficiente et la moins dangereuse. La justification de la pose d'un drain thoracique est moins claire: durée de transport conséquent, reconstitution du pneumothorax. Encore faut il avoir un drain.Si le cathéter du minitrach percut 2 peut être utilisé, c'est aussi le cas d'une ligne et d'une poche de perfusion qui semblent être une alternative à ne pas méconnaitre. "The equipment needed includes a 24-French chest tube, a 100-mL NS IV bag, a 1,000-mL plastic sterile saline bottle, and two standard primary IV tube sets. The sterile water bottle is prepared by first emptying the contents. Next, two holes should be cut large enough to fit the surgical tubing, one in the cap, and one in the top of the bottle. The IV bag and primary IV tubing should be attached and the tube should be cut between the filter and reservoir. This end is left open for a vent. The other outlet port should be cut open to allow one end of a surgical tube to be inserted. The chest tube is then attached to the plastic spike of the other IV tubing. The other end of the tube is placed into the sterile water bottle through the hole in the cap. The surgical tube from the IV bag outlet port should be attached to the sterile water bottle through the hole in the side. The surgical tubing from the sterile water bag needs to be long enough to reach the top of the IV bag. 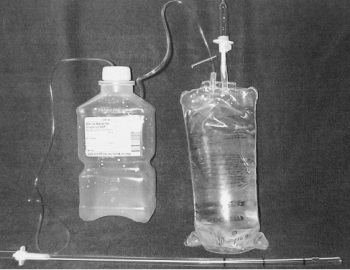 To operate the system, the IV bag should be inverted to keep the underwater seal to the sterile water bottle. This allows the long tube to stay underwater while the short tube vents air out of the bag. To dispose of any accumulated fluid, the chest tube is first clamped near the patient. The water bottle can then be removed and emptied while the cap remains attached to the chest tube. It is then a simple matter to reattach the bottle and unclamp the chest tube"
Faut il drainer avant de décoller: Non ? Air Transport of Patients with Pneumothorax: Is Tube Thoracostomy Required Before Flight ? Objective: It is conventionally thought that patients with pneumothorax (PTX) require tube thoracostomy (TT) before air medical transport (AMT), especially in unpressurized rotor-wing (RW) aircraft, to prevent deterioration from expansion of the PTX or development of tension PTX. We hypothesize that patients with PTX transported without TT tolerate RW AMT without serious deterioration, as defined by hypotension, hypoxemia, respiratory distress, intubation, bag valve mask ventilation, needle thoracostomy (NT), or cardiac arrest during transport. Methods: We conducted a retrospective review of a case-series of trauma patients transported to a single Level 1 trauma center via RW with confirmed PTX and no TT. Using standardized abstraction forms, we reviewed charts for signs of deterioration. Those patients identified as having clinical deterioration were independently reviewed for the likelihood that the clinical deterioration was a direct consequence of PTX. Results: During the study period, 66 patients with confirmed PTX underwent RW AMT with an average altitude gain of 1890 feet, an average barometric pressure 586-600 mmHg, and average flight duration of 28 minutes. All patients received oxygen therapy; 14/66 patients (21%) were supported with positive pressure ventilation. Eleven of 66 patients (17%) had NT placed before flight and 4/66 (6%) had NT placed during flight. Four of 66 patients (6% CI0.3-11.7) may have deteriorated during AMT as a result of PTX; all were successfully managed with NT. Conclusions: In this series, 6% of patients with PTX deteriorated as result of AMT without TT, yet all patients were managed successfully with NT. Routine placement of TT in patients with PTX before RW AMT may not be necessary. Further prospective evaluation is warranted. 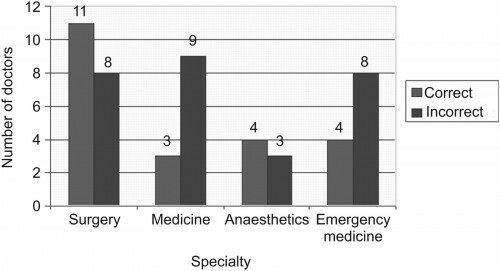 An audit of the complications of intercostal chest drain insertion in a high volume trauma service in South Africa. Intercostal chest drain (ICD) insertion is a commonly performed procedure in trauma and may be associated with significant morbidity. This was a retrospective review of ICD complications in a major trauma service in South Africa over a four-year period from January 2010 to December 2013. A total of 1,050 ICDs were inserted in 1,006 patients, of which 91% were male. The median patient age was 24 years (interquartile range [IQR]: 20-29 years). There were 962 patients with unilateral ICDs and 44 with bilateral ICDs. Seventy-five per cent (758/1,006) sustained penetrating trauma and the remaining 25% (248/1006) sustained blunt trauma. 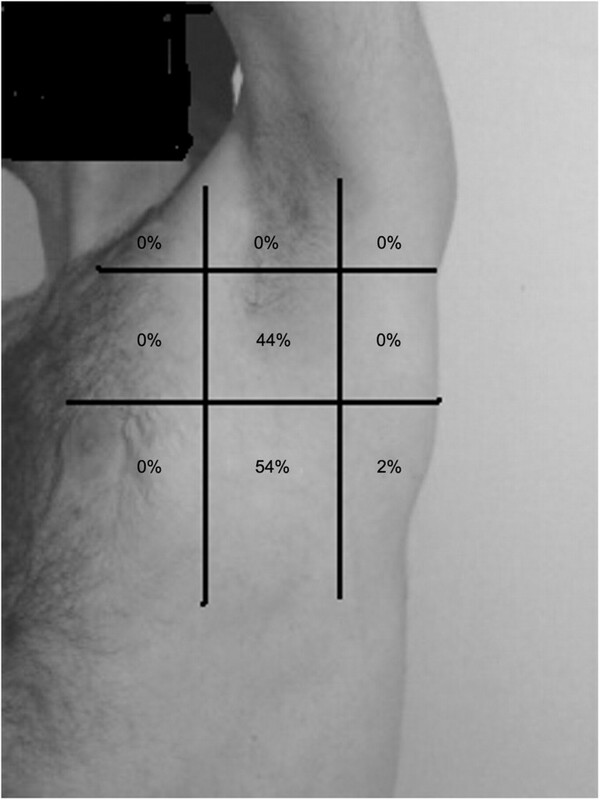 Indications for ICD insertion were: haemopneumothorax (n=338), haemothorax (n=314), simple pneumothorax (n=265), tension pneumothorax (n=79) and open pneumothorax (n=54). Overall, 203 ICDs (19%) were associated with complications: 18% (36/203) were kinked, 18% (36/203) were inserted subcutaneously, 13% (27/203) were too shallow and in 7% (14/203) there was inadequate fixation resulting in dislodgement. Four patients (2%) sustained visceral injuries and two sustained vascular injuries. Forty-one per cent (83/203) were inserted outside the 'triangle of safety' but without visceral or vascular injuries. One patient had the ICD inserted on the wrong side. Junior doctors inserted 798 ICDs (76%) while senior doctors inserted 252 (24%). Junior doctors had a significantly higher complication rate (24%) compared with senior doctors (5%) (p<0.001). There was no mortality as a direct result of ICD insertion. 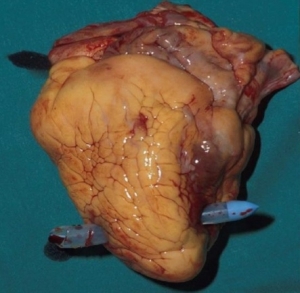 </sec> Conclusions ICD insertion is associated with a high rate of complications. These complications are significantly higher when junior doctors perform the procedure. A multifaceted quality improvement programme is needed to improve the situation. Chest drain insertion is not a harmless procedure – are we doing it safely ? La réalisation d'une thoracostomie au doigt et l'insertion d'un drain doit se faire de manière sécuritaire. Le choix de la voie axillaire est certainement à privilégier. Le drainage thoracique en condition de combat doit rester l'exception. Il peut se justifier en cas d'échec ou d'insuffisance de l'exsufflation ou de la thoracostomie au doigt. Il peut également s'envisager selon les conditions tactiques si le délai d'EVASAN es long. Le document ci-après présente de manière très didactique la réalisation de ce geste pas si anodin qu'il n'y paraît.